Grille Guards: Is Chrome or Black Better? 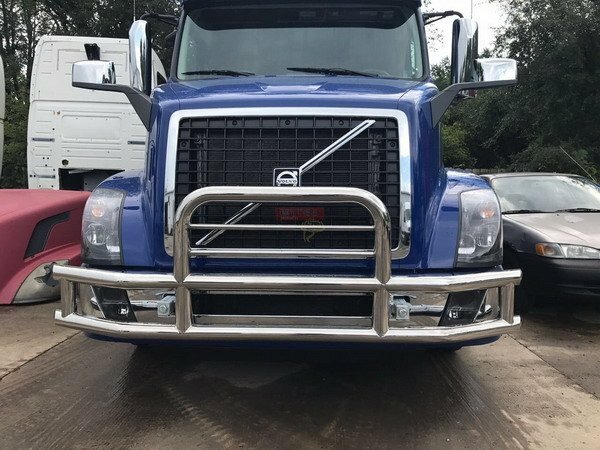 As grille guards are becoming more popular on big rigs, truckers are asking for advice on the best guard to buy. We frequently hear questions about finishes. Drivers want to know if a chrome-plated grille guard is better than one plated with black oxide. That depends on what you are after. Grille guards are functional pieces of equipment first. They are intended to prevent damage to the front end of a truck in the event of contact with an animal, another vehicle, a guard rail, etc. Beyond function is aesthetic value. Some truckers install grille guards just because they look awesome. That’s okay. A chrome grille guard will not perform measurably better than a black oxide guard for the most part. Black oxide finishes are a bit more ductile as compared to more brittle chrome, but the average trucker isn’t going to notice the difference. So why go with chrome? Aesthetics. There is no denying that polished chrome is stunning. That’s why truckers whose rigs are mainly showpieces include as much chrome as they can fit on the body. You have chrome toolboxes, headache racks, exhaust, bumpers, and grille guards. Although black oxide looks pretty slick in its own right, it doesn’t quite shine – literally or figuratively. That makes it an unpopular choice among showpiece owners. A possible exception are those owners hoping to achieve a different kind of look. Black oxide is not as common an option for big rig grille guards as compared to those made for pickup trucks and jeeps. Nonetheless, you can still find them if you know where to look. Black oxide compliments trucks with dark colors like black, navy blue, and so forth. It doesn’t look so good on lighter colored trucks. Just like chrome plating, black oxide is applied through a process that creates an electrical charge on the surface of the metal. The black oxide powder adheres to that surface due to an opposite charge. The two charges create a bond that is nearly impossible to break. Black oxide is more resistant to chips and scratches than chrome, so that is something to think about. If the grille guard you choose is all about utility and nothing less, you cannot go wrong with either plating choice. We mentioned in the introduction of this post that deciding to go with chrome or black oxide is really a matter of determining what you are after. As such, it might be that neither one is your best choice. The best grille guard for you might be made of polished stainless steel. Polished stainless steel is as durable and functional as chrome and black oxide plating. It looks darn good too. The best part is that it doesn’t require nearly the same level of maintenance as chrome. And it is even better than black oxide in terms of scratch and chip resistance. The thing with polished stainless steel is that there is no exterior coating. That means it is not going to show chips a few minutes after installation. It is not going to tarnish as quickly or easily, either. So while you might be constantly polishing chrome to keep it looking good, there is significantly less work involved with polished stainless steel. At the end of the day, there is no functional advantage to either of the three options. Whether you choose chrome, black oxide, or polished stainless steel really boils down to your aesthetic standards and how much effort you want to put into keeping your grille guard looking good. An RV or trailer cover is a tool used to protect your unit when it is parked and not in use. Like any tool, there are certain things you can do to make using an RV or trailer cover easier. There is no need to struggle with your cover every time you put it on or take it off. Efficiency is the key with RV and trailer covers. Your goal is to do as little work as possible while still providing maximum protection for your RV or trailer. So just like a truck driver seeks to learn the most efficient way to use tarps to cover flatbed loads, you can make your life easier by learning the most efficient ways to use your RV cover. We have a few tips. One of the reasons you are using an RV cover is to protect your unit against dirt, debris, mold, and mildew during the off-season. You will not get the best use out of your cover if you don’t wash your rig before you cover it. What’s worse, covering a dirty RV or trailer could mean you’ll be scrubbing it clean at the start of the next season. It is almost always easier to wash an RV or trailer at the end of the season. So take a few hours and do a good cleaning and drying job. You will be glad you did when you uncover a clean, shiny RV in the spring. Have you ever tried hauling your RV cover up to the top of your rig slung over your shoulder? It is hard work. Well, there is a better way. Unpack and unfold your cover on the ground rather than carrying it to the top of your rig. You can then connect a strap to one of the corner clips and gently hoist the cover up over your rig section by section. Just go slowly so you don’t catch the cover on something and tear it. Both cleaning and covering your RV is a lot easier when you have help. And guess what? That’s what family members and friends are for. Enlist some help to make the job easier – both at the end of the season and at the start of the new one. If need be, reward your helpers with a pizza and a cold one. It’s well worth the money you’ll spend to not break your back covering and uncovering your RV. We assume you’ll want to store your cover during the RV season. You can work for hours trying to fold it into a nice, flat rectangle that fits nicely on the shelf – if you enjoy that sort of thing. But there’s a better way. Purchase a plastic garbage tote on wheels. With a garbage tote, you don’t have to fold your cover up into a perfect rectangle. Fold it twice along the length, then just roll up into a tube. It should fit nicely into your tote along with your straps, cables, hooks, etc. As an added bonus, the garbage tote will keep the cover dry and protected against heat and sunlight. You have invested in an RV or trailer cover because you want to protect your rig. It is a very wise decision. Do yourself a favor and protect your own physical health and mental sanity by deploying the four tips we discussed here. The more efficiently you use your RV cover, the happier you are going to be.